From the glacial lakes and the stunning shorelines of Adriatic and Riviera to the enchanting splendour of Alpine and Dolomite Mountains, there’s undeniably plenty that awaits exploration in the Northern region of Italy. The region is known for its diverse topography and is what makes it a go-to destination for tourists from across the globe. In addition to its geographical diversity, Northern Italy also boasts of upscale shopping, fine wine, and luxury resort. So, whether dining at world-class cuisine and sampling fine wine or exploring the ancient cathedral, churches or castles, the region presents all memorable experiences that tourists look for in a holiday in Italy. Located in the Venetian lagoon, Venice is a city in an Island that exceeds expectations of magic and magnificence. It is a city packed with incredible architecture and art that makes it a top destination for millions of tourists. 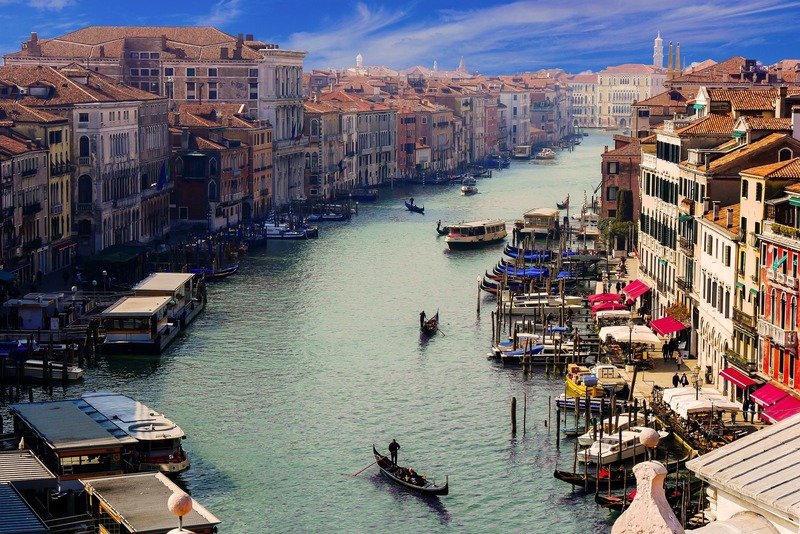 Venice’s attractions include the Bridge of Sign, San Giorgio Maggiore, Ca’ d’Oro, Santa Maria Della Salute, Ca’ Rezzonico, Piazza San Marco, Rialto Bridge, Doge’s Palace, Grand Canal, and St. Mark’s Basilica and Campanile. Rome is a city of love, but it has so much more to offer. Rome is home to impressive fountains, monuments, squares, and attraction. Some of its top sights include the Colosseum, Roman Forum, The Vatican City, St. Peter’s Square, Piazza Navona, Galleria Borghese, Capitoline Museums, and a range of churches and Basilicas. This is undoubtedly one of the most stunning places in Italy. A tour to a single one of its five villages of Monterosso, Vernazza, Riomaggiore, Corniglia, and Manarola will confirm this. The picturesque view of towns built on high cliffs and steep hills facing the Mediterranean makes Cinque Terre a perfect destination for postcard pictures. And the best part is that these towns are easily assessable by train. This is the most watersports- and family-oriented lakes in Italy. It also is the largest lake in the region, stretching from the northern edge of the Po Valley to the steep alpine foothills. Towards its southern shore, Lake Garda is backed by low hills and lined by beaches and in its north, on the western shore, sheer cliffs and mountains. The terrain of Lake Garda makes it a perfect destination for wide-ranging sports including windsurfing and sailing to rappelling, mountain biking, and mountain climbing – all with stunning lake views. Portofino boasts of its verdant scenery, picturesque harbour and haphazard rows of waterfront and hilltop homes. Situated near the south of Genoa, the village has been and is still very well sought-after for its offerings, including the cluster of yachts, a lighthouse at Punta Portofino and historic Church of San Giorgio. Even after World War II bombing, Milan still managed to reconstruct its glory. Tourists flock to Milan to view the Santa Maria della Grazie, which displays da Vinci’s “The Last Supper”. There’s also the Sforzesco Castle that’s home exhibits of Museod’ArteAntica including “Pieta Rondanini” a Michelangelo’s creation. Also referred to as “La Rossa” Bologna, Emilia-Romagna’s capital, is highly sought-after for its extensive porticoes and medieval towers. It also is home to world’s oldest college, the University of Bologna that stills enrol students every year. However, no trip to this largest city in the region is complete without a tour to Piazza Maggiore to view the beautiful interiors of the Basilica of San Petronio. I’d add Stresa on Lake Maggiore, Torino, Alba and Barolo in Piemont as well as Treviso and Padova in the Veneto. So many beautiful places to see in northern Italy!